The RC390 certainly isn’t cheap. So the question is, can it justify that hefty price tag? This is the KTM RC 390 and it might just have the most exciting visual design in the motorcycling world. The mixture of smooth surfaces, sharp angles and exposed trellis frame all cohere into an aggressive and beautiful looking machine. 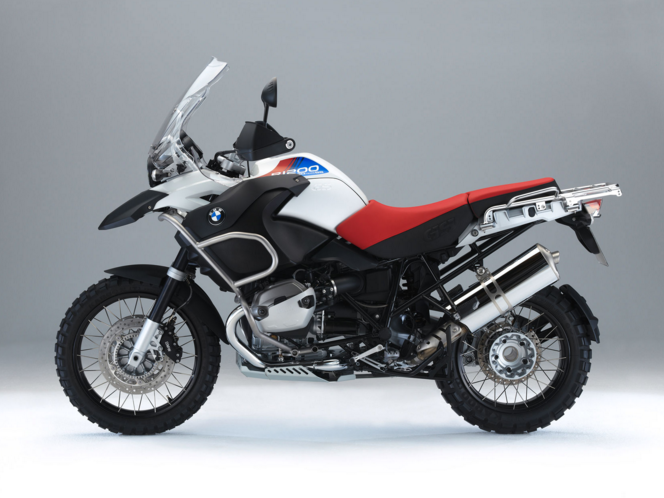 It is the motorcycle that almost any biker will do a double take at, and with good reason too. No other bike in this category looks quite this purposeful. Also, unlike other bikes in this class, it doesn’t try to mimic the looks of its larger in-house counterpart, the RC8. Starting from the front, two individual lamps stare back at you from the recesses of a dark cowl, like a predatory animal. Moving to the rear the exposed orange trellis frame comes at you like a delinquent from Geordie Shore. The rear light has a unique design that extends from the tail to beneath the seat, while a red LED strip runs down the middle. Although the bike may look like a single seater, it actually seats two, with the rear seat being a piece of soft(ish) moulded foam, neatly disguised to look like a rear seat cowl. The colour scheme completes the visual explosion that is the RC390. The body displays a seemingly sober white-and-grey scheme, which is offset rather loudly by the vivid orange framework and wheels. Talking about loud, though, this is where the RC390 disappoints, mostly because you’d expect it to sound as sporty as it looks. Alas, when idling it sounds less like a thunderstorm and a bit more like a Honda E-Storm. This can be remedied by fitting the optional Akrapovic slip-on pipe, or rather more cheaply by just riding harder, as the higher up the rev range you go, the better the aural persona becomes. Yet given that it sounds best when ridden at speed, it needs exemplary handling when the roads go twisty. And handle it does. 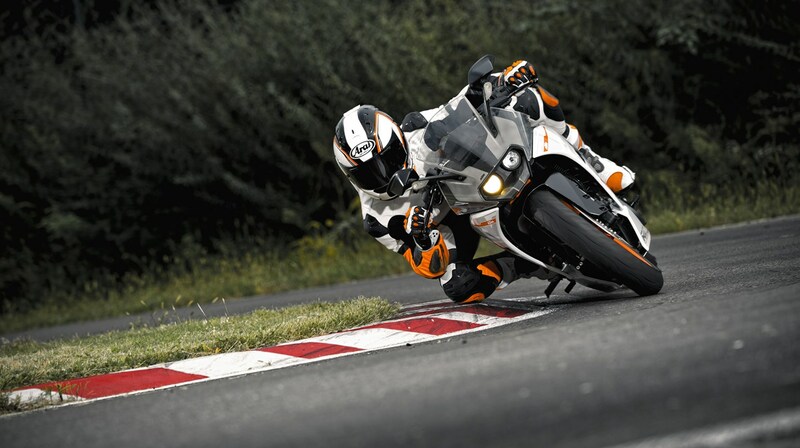 The RC390 comes standard with WP suspension, using a rear mono-shock and front upside down forks, the latter which is unique in the sub 600cc sportbike market. The whole set-up is not instantly confidence inspiring, as the ultra quick turn-in can be intimidating for inexperienced riders. However, once used to it, this bike grips incredibly well, and could deal with far greater talent than my own to get the best out of it. It feels as if it was designed to just attack corners, because as roads get tighter, this bike just gets better and better. As a commuter, the RC390 works surprisingly well. It’s not the comfiest bike ever, but you could guess this much just by looking at it. Yet in traffic it is easy to handle and so nippy at town speeds, helped by how light the bike is, with a dry weight of just 147kg. The brakes are also best at town speeds, providing good feel and more than ample stopping power. (The bigger the speed, the less effective they are.) The RC390 comes standard with ABS, which I assume would be a real positive for people who commute come rain or shine. Moving on to how it performs and yet another surprise. 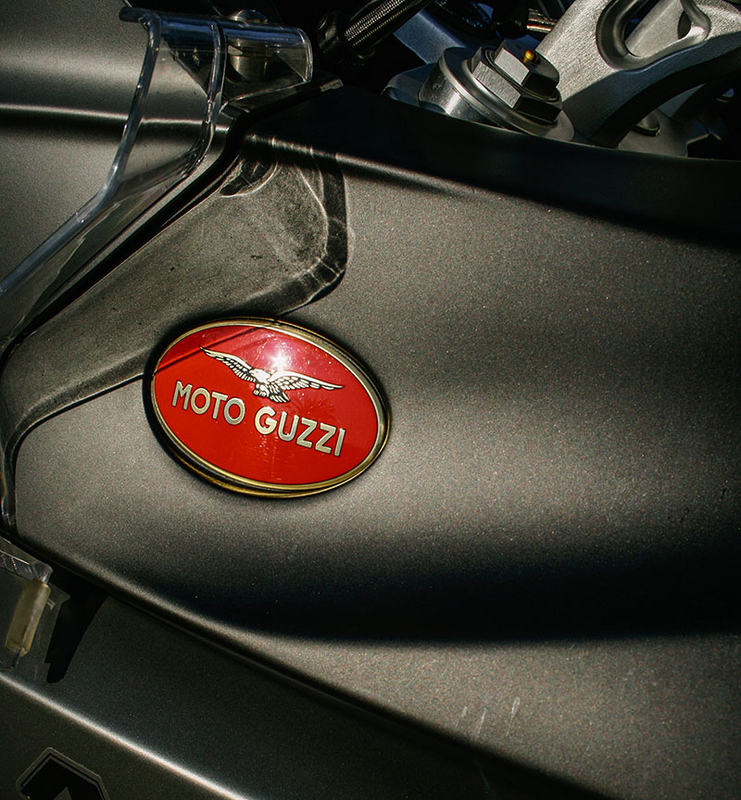 With a power figure of 43bhp (32kW) and torque rated at 35Nm, it’s not going to tear your face off. 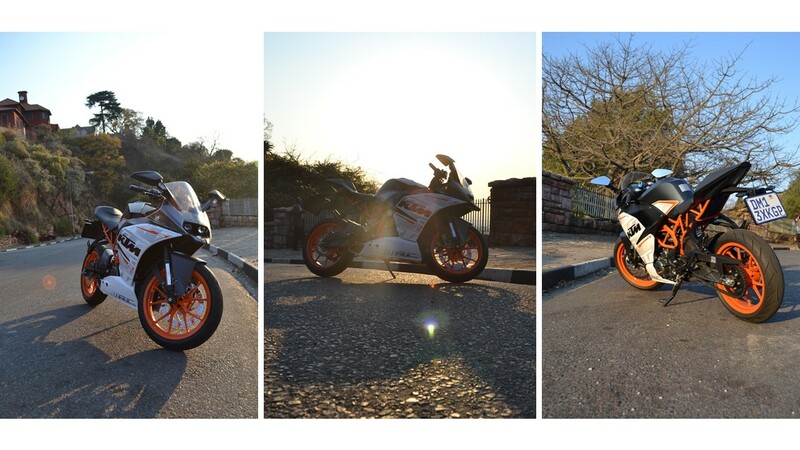 But considering those figures, I didn’t anticipate just what a sprightly little machine the RC390 is. Especially at speeds below 120km/h, this bike really is more exciting than expected. It is also has very short gearing, so on roads that are technical and require a lot of rider input and gear changes, this little machine can punch its way into your heart. If you are planning to use this as a Sunday breakfast-run machine, you’ll be disappointed. 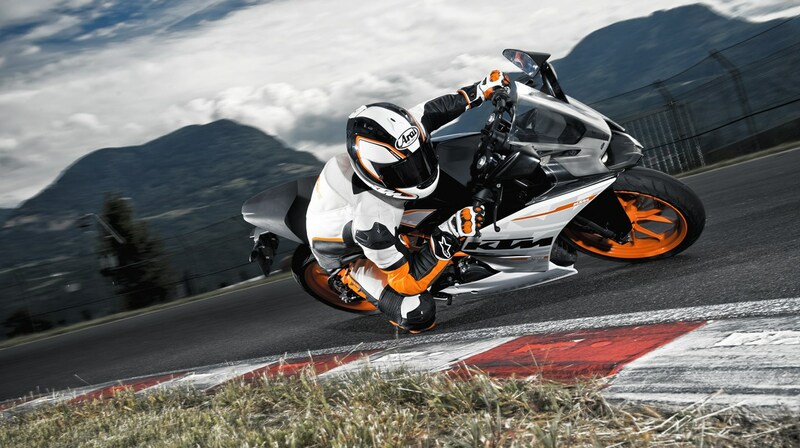 The RC390 was not made for highway cruising, and one ride can tell you this much. Not that it can’t get up to highway cruising speeds, but feels as if you’re asking too much of it if pushing beyond 120km/h (which you technically shouldn’t do in any case, so don’t complain). 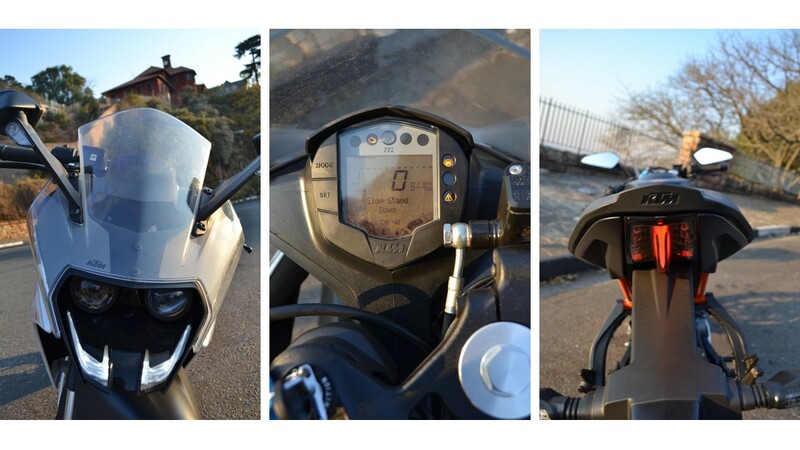 Once on the move, the controls are like that of any other bike, but the instrument display is a mixture of cool, convenient, informative and crap. It’s a full digital display that shows speed, revs, range and consumption figures all on one screen. To see the range, average speed or consumption, press a toggle button to the left of the screen marked ‘Set’. There’s also a button marked ‘Mode’, which sounds really, really exciting, but once pressed, it merely switches between the trip meter and the odometer. The other complaint is that the horizontal tachometer is unreadable, but it’s not entirely necessary, as there is a shift light that comes on when you’re about to destroy the engine at a relatively low redline of 10 500 rpm. All in all the RC390 is a really fun little bike, with some genuine urgency to it. On the highway it is a bit tiring, but for streaking through traffic and annoying sleepy suburbs it is nigh incomparable and probably far more tiring for your neighbours than it is for you. Its low weight makes it go, stop and turn like a border collie on speed, and, terrible analogy aside, no other bike of this type and class can come close to the fun factor this little bike possesses. 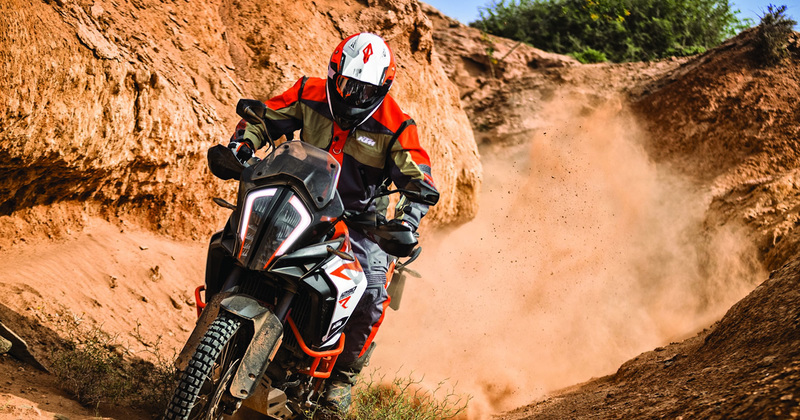 The standard ABS, Bybre brakes and WP suspension also give the bike a performance edge that can be neatly translated into bragging rights too. The down-sides are that it is pretty uncomfortable (even for indestructible teenagers), and it vibrates like a washing machine on spin cycle when ridden at low revs. The dash display is cluttered and the buttons to toggle through what is displayed are useless when wearing gloves or on the go. 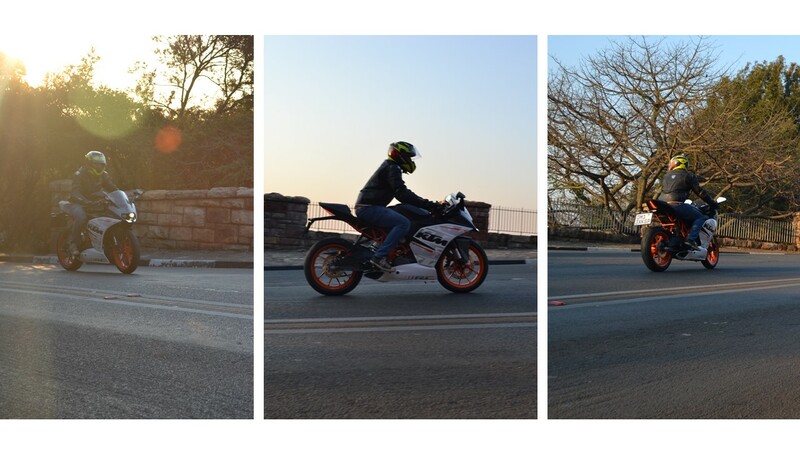 Another drawback is that the hyperactive look of the RC390 won’t appeal to an older crowd who can actually afford the R62 999 asking price, even if it is worth every single cent. For those who have just reached the legal age for over-125cc bikes, this is the chariot of the gods.